It was still raining in the morning. Even though I had been careful, my bag got wet. Wet legs? Sweat? Condensation? Oh, the little puddle at my feet… The down was only ~1-2” deep over top of me. Boo was curled into the corner of the tent, in another puddle. We were both warm enough, but it was a good thing it wasn’t cold and we weren’t sleeping out another night. We had a small creature (lizard? salamander? newt?) 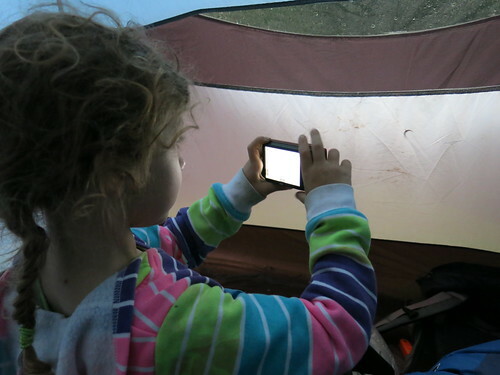 on the tent. We took a picture of its shadow, but we never got a look at it. Eventually the rain let up enough that we got out of the tent to start breakfast. The worrisome waterfall in the trail out was down to a reasonable stream size. We could all walk that with our packs. But we had almost as long a day planned for Day 2 as Day 1. And the trails would probably be wetter and slicker. The rain had really demoralized the kids, probably because they were cold and wet starting out. Breakfast helped, but we decided that, instead of pushing for our planned pickup point, we’d bail, and head for the trailhead less than a mile away by Looking Glass Falls. The bridge across the river was high, so it should still be in place. We texted G our alternative pickup plan. Breakfast was good for the kids. Oatmeal and hot chocolate. S and J had homemade oatmeal with stuff. J insisted at length that it was the best oatmeal he’d ever had. My coffee was half rainwater and half hot water. Once we got confirmation from G that she could get us, we told the kids they only had a mile to go, and that cheered them immensely. Boo went from whiney floppy to excited in 2 sentences. And the heavens opened again. But not the flooding rain of the night before. Then we had to pack up. (Mostly) dry sleeping bags in the plastic trash bags we use for backpack liners. Wet clothes and food bag in Lee’s bag. Wet tent in my bag. I usually roll the tent, but I just wanted to get going. Oof, everything’s a lot heavier! J and S have raincovers for their bags. They fussed a bit getting the covers over their sleeping pads. J was shivering in his shorts as we did a last sweep of the campsite, making sure we’d gotten everything. Lee fed Boo a double chocolate espresso granola bar as everyone loaded up. I chose to hike in my raincoat over wool shirt, and nylon shorts. Keep my torso warm and dry (mostly), and let my legs get wet. It wasn’t any colder than 60F, with very little wind, and it worked for me. Boo started with the bottoms of her pants on, but requested them off soon after they got wet. It was slow going. Yes the waterfall was down, but the trail was 1-2” deep and rocky. Boo needed a lot of help. We generally kept much closer together than the previous day, but there were many more places where we went one at a time so we didn’t fall into each other (a lesson the kids have not yet internalized). The kids were troopers. The wet rocks were harder on Boo’s little legs. She usually keeps up pretty well, but she was hands down the limiter on speed. The kids weren’t allowed to hike next to each other; we wanted an adult on either side of both of them Just In Case. Skinny Dip Falls was very high. We found an abandoned Angry Birds t-shirt. It amused us so much we took it home. We emerged from the woods, stomped through one final rivulet of water, and were at the road. We couldn’t see far between the twists of the road and the fog, but we listened carefully and crossed like a family of ducks (single file, kind of scattered, hoping everyone would make it). As we walked into the pull-off, G turned in behind us! G took our picture, then we stripped off everything we could and threw it in the truck before the rain picked up again. We stopped at our planned take-out point, and, no, there was no way Boo could have made it, and the rest of us wouldn’t have had a good day, either. Back at the house, there was just enough sun that afternoon to dry our things on the porch. It was the last sun we’d see until Friday afternoon.